Cuban diplomats expelled by US amid ‘hearing loss’ claims. Washington has expelled two Cuban diplomats after US embassy staff in Havana suffered mysterious physical symptoms, the US state department said. It was not immediately clear what had happened, with spokeswoman Heather Nauert saying there were no “definitive answers about the source or cause”. Reports suggest US diplomats could have suffered hearing loss related to the use of covert sonic devices. Cuba’s foreign ministry said it was investigating the allegations. It called the expulsion of its staff unjustified but said it was willing to co-operate with Washington to clarify what had happened. 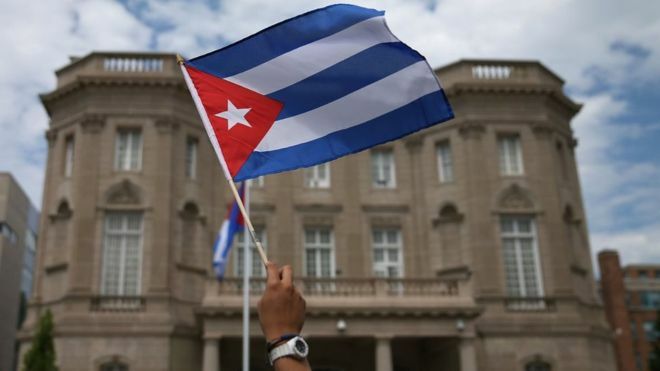 “Cuba has never, nor would ever, allow the Cuban territory to be used for any kind of action against accredited diplomats or their families,” the ministry said. The Associated Press reports the diplomats’ hearing loss could have been linked to sonic devices which emit inaudible sound waves that can cause deafness. About five diplomats, including some spouses, had been affected, but no children were involved, US officials said. Ms Nauert said staff began complaining of the strange symptoms late last year. Ms Nauert said the government was taking it “very seriously, and there is an investigation currently under way”. It is understood that the two expelled Cuban diplomats left Washington DC in May, the BBC’s Will Grant reports from Havana. Cuba’s state security closely monitors US diplomats, many of whom live in housing owned and maintained by the Cuban government. “The Cuban government has been harassing US personnel working in Havana for decades,” he said. “This has not stopped with President Obama’s appeasement.